Prof. Nasser Rabbat, Director of the Aga Khan Program for Islamic Architecture at MIT, will present a lecture on Islamic architecture titled "Heritage Conservation and the Fractured Arab Modernity" at the Nasher Museum Auditorium, Thursday, November 8 2018 at 5:30PM. Free and open to the public. 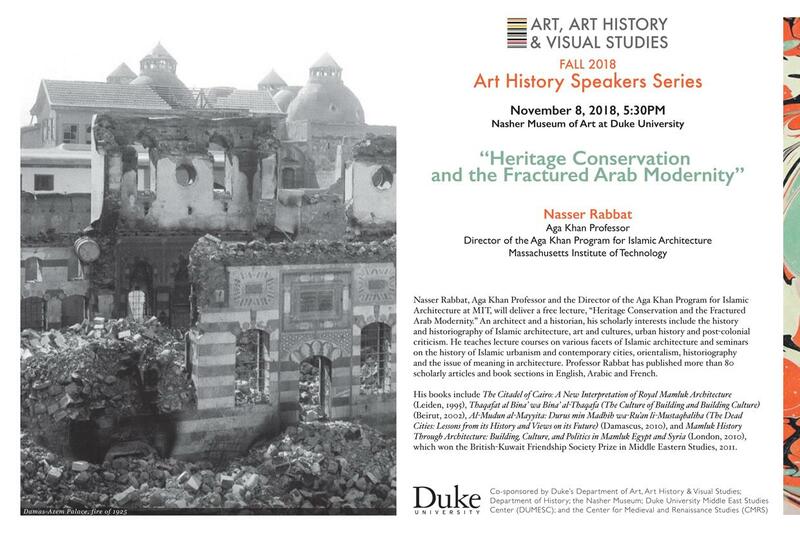 Co-sponsored by Duke's Department of Art, Art History & Visual Studies; Department of History; the Nasher Museum; Duke University Middle East Studies Center (DUMESC); and the Center for Medieval and Renaissance Studies (CMRS).